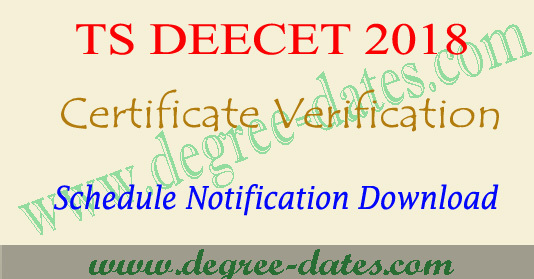 Here available details are TS deecet certificate verification schedule 2018,TS dietcet counselling 2018 fees structure,telangana ttc required certificates list 2018,ts deecet 2018 helpline centers.ts deecet 1st phase and 2nd phase certificate verification details. 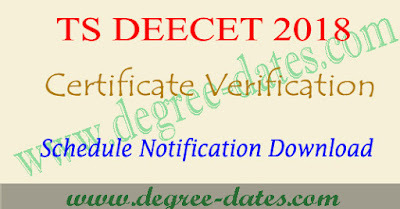 DSE Telangana is decided to conduct the verification of certificates for .qualified candidates of ts deecet 2018 exam between the given dates.Hence the students who were qualified are requested to attend the Government DIET College of the concerned District from where they appeared for TS DEECET 2018 Exam with all original certificates on working hours (10.00 AM to 5.00 PM). The following original certificates are to be produced for verification for ts deecet 2018. In case of special category candidates Viz PCP, NCC, Sports, Scouts and Guide and CAP candidates should submit relevant certificates in support of their claim. Further, all the candidates are informed that if they are not attended for certificate verification they shall not be allotted any rank and they are not eligible to participate in the ts deecet counselling. Hence they are requested to attend for certificate verification without fail. Further all the candidates are requested to download the verification check list form web site tsdeecet.cgg.gov.in and attend the Govt. DIET from where they appeared for DEECET 2018 Exam for verification along with one set of Xerox copies of certificates. For further details and downloading of verification check list visit web site www.http://tsdeecet.cgg.gov.in or contact Mobile No 8179517010.